Do you love astrology and read your horoscope monthly or even daily? Are you addicted to shopping and follow the latest fashion trends on Instagram? Wouldn't you love to be able to combine both interests into an innovative new career that enlightens people’s lives through astrology psychology style consultations? The Sterling Style Academy is proud to launch our new approach to Image Consultant, Personal Stylist and Personal Shopper Training by incorporating your Astrological Style Personality into the way you consultant and dress clients. As the pioneers of Astrology Style Consulting in 2013, we are pleased to announce our newest guest faculty Astrology trainer whose expert knowledge in astrology assisted Sterling Style Academy’s founder Image Consultant and Personal Stylist, Michelle T. Sterling to develop the curriculum for the first two days of the Astrology Personal Style Consultant and Stylist Training program. The Sterling Style Academy Astrology Personal Style Consultant and Stylist Training program enables you to take a deeper look at how your client thinks, feels, and acts in order to truly know how to assess and dress them from the inside out. We offer two types of training programs: a 5-Day Astrology Personal Style Consultant Training Program or a 7-Day Image & Style Consultant, Personal Stylist, and Personal Shopper Training Program. These two programs begin with 2 days of Astrology Style Personality training and are combined with our 3 or 5 Day Personal Stylist & Personal Shopper Training Courses. Day 2: Astrology as it Relates to Fashion – Learn how to consult clients according to their Astrological Personality Trinity; and how to identify and understand the general fashion styles of the 12 zodiacal signs according to color, fashion brands, articles of clothing, accessories and gem stones. In addition to receiving our top-notch curriculum and training manuals, our 5-Day Astrology Personal Style Consultant training certification program provides you with the Sterling Style Academy What Are My True Colors Booklet. We recommend purchasing the following supplementary Sterling Style Academy image consultant training books and DVDs to receive a fully comprehensive training experience: Personal Style Consultation Book, DVD, and USB; Wardrobe Consulting; Personal Styling; and our Image Consultant Sales, Marketing and Business Brand Identity Launch Kit. 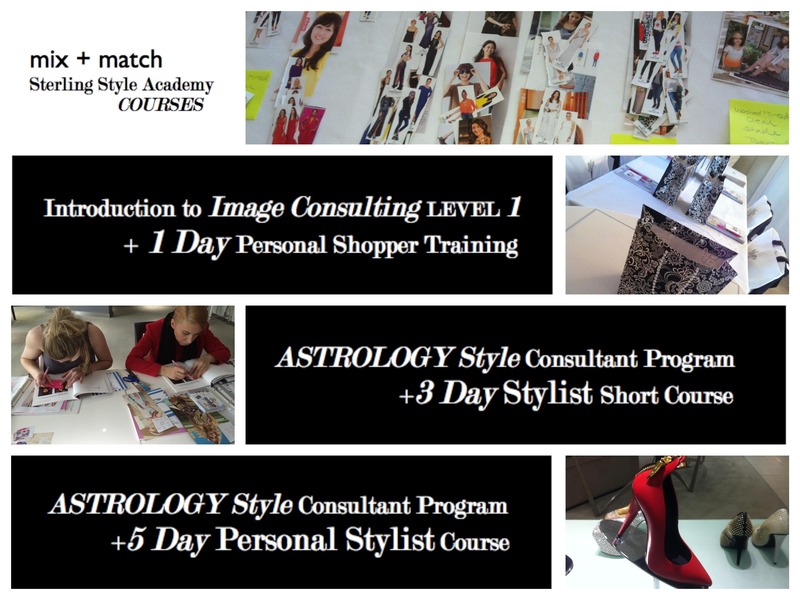 Upon graduating from this program, you will be certified as an Astrology Personal Style Consultant & Personal Shopper. Day 3: Body Shape Analysis – Learn how to identify and evaluate various body types and silhouettes; how to examine facial features, body proportion, texture, and pattern in order to determine which clothing silhouettes and fabrics will highlight or conceal those features for men and women. Day 7: Marketing & Business Development – In conjunction with our Sales, Marketing, Business Brand Identity Launch Kit, you will learn how to define and market your services, set fees, and map out your business plan and objectives as well as create a professional bio, a 30-second introduction, and press releases to effectively sell yourself. In addition to receiving our exceptional curriculum and training manuals, our 7-Day Astrology Image & Style Consultant training certification program includes the Sterling Style Academy What Are My True Colors Booklet, Personal Style Consultation DVD & Workbook, Personal Styling and our Sales, Marketing, Business Brand Identity Launch Kit (usually sold separately to students) to guarantee outstanding consultations and to give you the tools you need to build a thriving business. We recommend purchasing the following supplementary image consultant training book and DVD: Wardrobe Consulting to complete your experience. Upon graduating from this program, you will be certified as an Astrology Image & Style Consultant, Personal Stylist and Personal Shopper. Only Sterling Style Academy graduates may enroll into the 2-Day Astrology Style Consulting Training Program. All new and prospective students need to enroll into either the 5-Day Astrology Personal Style Consultant Training Program or the 7-Day Astrology Image & Style Consultant, Personal Stylist and Personal Shopper Program to receive certification. Program Schedule: 10:00 a.m. – 4:30 p.m. with assignments to be completed in the evenings. To register for the 5-Day Astrology Personal Style Consultant Program and make your investment today, please click here. To register for the 7-Day Image & Style Consultant, Personal Stylist, and Personal Shopper Training Program and make your investment today, please click here. ***IMPORTANT REGISTRATION MESSAGE*** When registering for the 5-Day Astrology Personal Style Consultant Program, please place the number 1 into the box that says 2 Day Astrology Style Consulting – Dubai for USD$1,950 AND also place the number 1 into the box that says 3 Day Color, Styling & Shopping – Dubai for USD$3,147. When registering for the 7-Day Image & Style Consultant, Personal Stylist, and Personal Shopper Training Program, please place the number 1 into the box that says 2 Day Astrology Style Consulting – Dubai for USD$1,950 AND also place the number 1 into the box that says 5 Day Personal Stylist & Shopper – Dubai for USD$5,797 then press submit. Upon receipt of your registration form, we will send you a Welcome Package outlining the logistics of the training program, suggestions on where to stay, a detailed agenda, and much more. Your investment does not include air fare, lodging, transportation, personal expenses, school supplies or meals.